As one of their friends mentioned in a letter posted on their website, they do the things that they sing about in their songs. 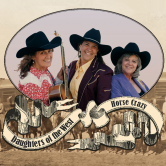 Horse Crazy Cowgirls sing and swing and have good fun on stage and off stage they are likely to be found ridin’ and ropin’ and ranching along with the tunes they hum. They have a legion of fans among those who live that life and we’re pretty darn sure that our Seattle city friends are going to love seeing and hearing them in the context of our vaudeville Varietè shows on a fun night.